It’s been over 10 years. 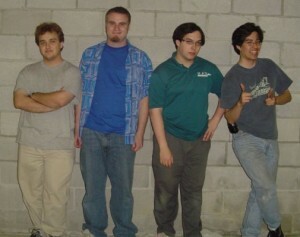 Eric Yockey (CEO, Unit-e Technologies) and Eric Ruth (Eric Ruth Games, Pixelforce, de-makes of “Left 4 Dead,” “Team Fortress Arcade”) collaborated on a number of unlicensed music dance game projects for PC. 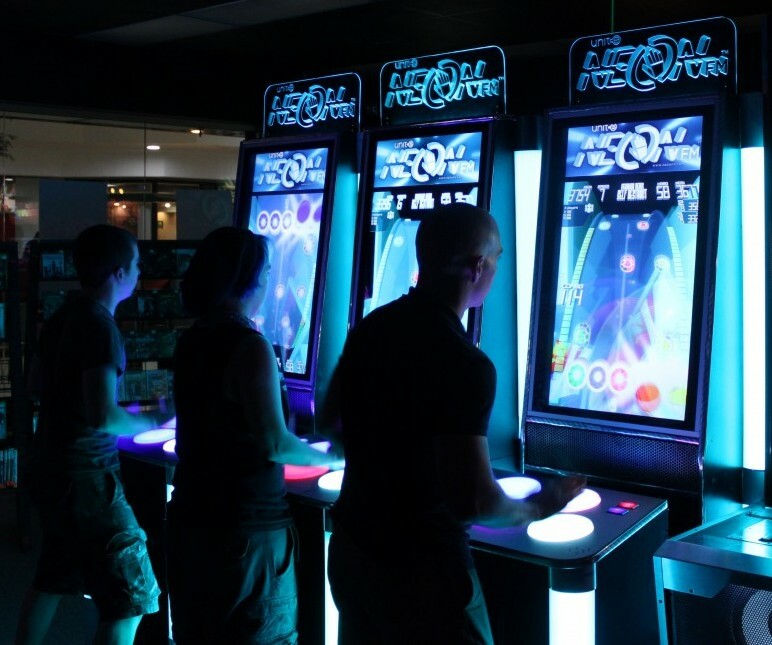 It had been a few years since an arcade dance game had been released in the USA, and the two were approached by an investor who proposed they make an arcade dance game with licensed music. The investor later removed himself from the project for reasons unrelated to the game, but the project re-branded as “Neon FM: Dance Radio” and continued. 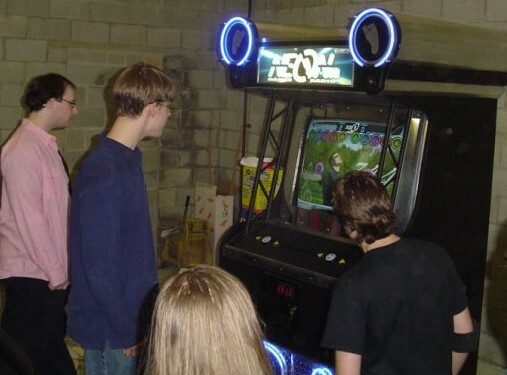 The core team grew to four members with the addition of David Riley (electrical engineer) and Robert Ota Dieterich (programmer, iNiS corp.), who formed the company “Pop’nKO Music & Entertainment, LLC.” A large arcade manufacturer and distributor took a keen interest in the game, due to the void of supply and severity of demand from the market for another blockbuster dance title. A contract for the exclusive manufacture and distribution of “Neon FM: Dance Radio” was negotiated and signed soon thereafter. The company leased office space and began prototyping in earnest, with all team members leaving their day jobs to take full-time positions. Communication and capital from the distributor had ceased in the months since the initial signing. The distributor broke their silence that summer to inform the team that they would no longer proceed with the project, citing patent concerns with an existing dance game franchise. Efforts to find another manufacturer and distributor proved fruitless, with some parties citing a fear of retribution from the former distributor. Despite a diligent effort and securing personal loans to maintain operations, the company was forced to declare bankruptcy in the following months. Yockey worked full-time in construction and part-time as a mobile DJ to repay most of the loans incurred by the venture. 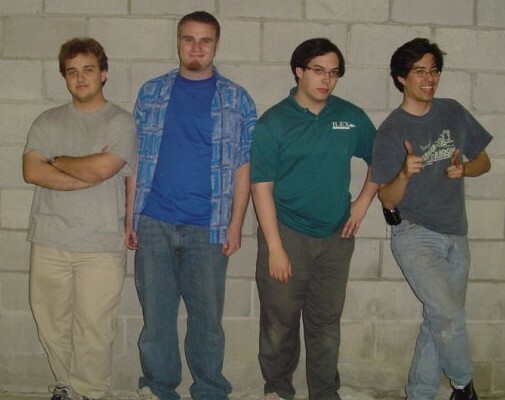 Ruth was homeless for months until he raised enough money working retail to rent an apartment, where he pursued his career in indie game development, starting Eric Ruth Games and the Pixelforce series. David found work as a network administrator, and Robert moved to Japan to put the project behind him and be with loved ones. Yockey pursued a formal business education as he prepared to rebuild the game studio. Unit-e Technologies was founded in 2011 to sell the studio’s flagship title “Transgression” on the Xbox Live Indie Games marketplace. Soon after, Charles Lohr (hackaday regular, electrical engineer) and Adam Geary (mechanical engineer) joined the team and devised the fitness-infused racing game “Cardiac: Fitness Racer,” for gyms, school, and arcades. The team demonstrated the game live at numerous events. Yockey completed his MBA, building the new studio on a far more solid foundation than the last. Recognizing the capital requirements of bringing their fitness game to market, and with consultation with Eric Ruth and a suggestion from Eric Holniker (Project Lead, Pump It Up Infinity), the team decided to sideline their fitness game to resurrect Neon FM™, which had gained a small cult following in its original inception. The game was redesigned to be played with hands instead of feet, and the software was rebuilt in its entirety by Yockey in Unity3D. The prototype machine was demonstrated at MAGFest 12 to great acclaim, and debuted as a product at the AMOA/AAMA Amusement Expo in Las Vegas in 2014. Keep up with Neon FM through our Facebook and Twitter feeds!